Water sampling: we will use the available shipboard Niskin bottle system. At each station, 12x24L (288 L) seawater will be taken in order to analyse various chemical and biological parameters. Physical / chemical parameters will be taken by the CTD system for each station. 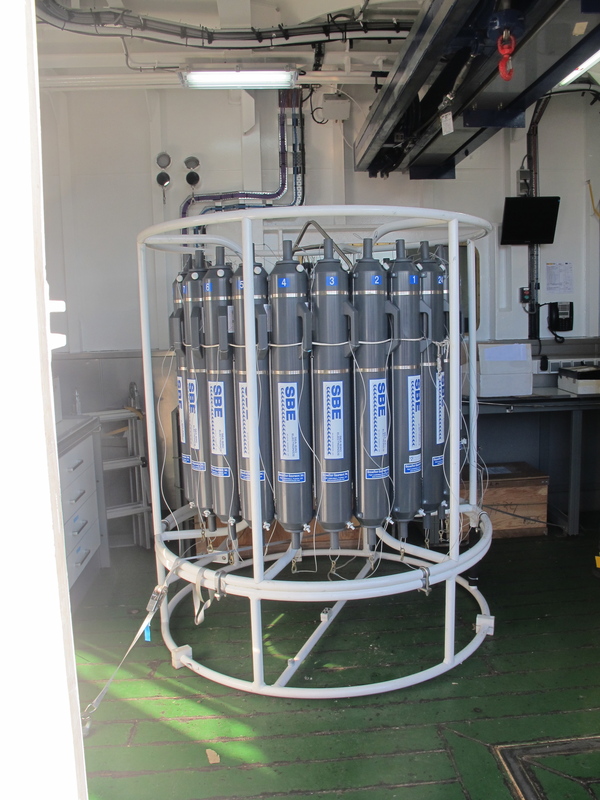 For surface water sampling, it will be used the continuos water system available on the ship. Bioaerosol sampling: We are collecting samples of airborne microorganisms using a collector of bioaerosols located in the top of the vessel. The samples are collected everyday during 6 hours. We would like to know the abundances, identity and diversity of airborne microorganisms over the ocean. Plankton sampling: we will sample for jellyfish, foraminifera and pteropods using different systems such as Neuston tows, Bongo nets and MOCNESS. Sampling for air-sea gas fluxes of ammonia: we will sample for underway seawater system while the ship is underway, atmospheric measurement in aereosol collectors and neuston tows. Sediment sampling: it will be performed using the multicore system (UTM). In the 4 (+2) stations, all located above 1000 m water depth, the aim is to obtain undisturbed high resolution sediment to study anthropogenic effects occurring in the past last few centuries. In some stations (HyperStations), there will be a sampling of suspended particles through depth pumps. The MedSeA cruise is cooperating with the Geotraces program to cover the section GA04, in combination with a NIOZ cruise on board the Pelagia. Both cruises will take samples to determine the distribution of the GEOTRACES TEIs and many other parameters.